Trump’s candidacy is transforming the Republican Party and party lines. If Trump is nominated by the GOP — and especially if he wins in November — he will have transformed the GOP from the party of (nominal) conservatism to the party of working-class-whites-seeking-their-share-of-government-bestowed-privileges. Everyone who wants to preserve or expand the power of government to do something that they favor. In sum: The two parties will represent the grasping, intolerant, and controlling forces of oppression. True conservatives (and libertarians) — who seek nothing from government but to be defended by it, and who understand the wisdom of long-standing social norms and the civilizing institutions of civil society — will be out in the cold. 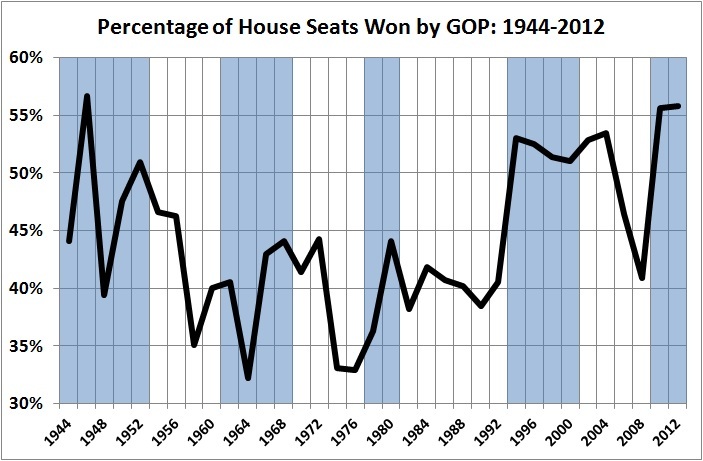 The GOP has been written off before — notably in the 1930s and 1940s, the early 1960s, and 1990s. But the strangest things keeps happening: New voters don’t always live down to the left’s expectations; new voters become older voters; and, most surprisingly, a lot of voters are not to be pigeon-holed as easily as leftists would like them to be. I do not mean to say that current trends are entirely favorable to the GOP. The following table compares the “Redness” (and “Blueness”) of States in recent presidential elections (1996-2008) with their Redness in earlier elections (1972-1988). (I go back only to 1972 because that is when the Southern States became solidly Republican, following the Wallace interlude of 1968). The good news is that the Red States (in 1996-2008) have 281 EVs, as against 257 for the Blue States. If the GOP is “doomed,” it a long way from dead. It has been closer to death in the past than it is today, and yet it is now alive and well. Only a fool says that anything (other than death and taxes) is inevitable. The death of the GOP is not among life’s inevitabilities. This is a followup on my election-morning predictions, a prognosis about the next two years, and a diagnosis of the “progressive” disease. I expected the GOP to gain eight seats in the Senate. But that prediction ran aground on the narrow wins by Democrats Michael Bennet and Harry Reid in Colorado and Nevada. The race in Washington hasn’t been decided, but it seems that Patty Murray will retain her seat. The Alaska seat will wind up in GOP hands — it’s just a question of whose hands. So, when the dust settles, the GOP will have gained 6 seats and the Dems will retain a majority. That’s as good as it was likely to get. And it’s good enough, because with 47 seats (and only two or three RINOs in the mix) the GOP will command a cloture-proof minority. Things turned out better in the House. I expected the GOP to end up with 237 seats. But when the dust settles on 10 9 undecided races, the GOP probably will hold between 239 seats (the current count) and 242 seats (adding 3 races now led by GOP candidates). Needless to say, the GOP will command the agenda in the House. The incoming tide of new Republican members will put a lot of pressure on GOP leaders to undo what Pelosi and company wrought. The stumbling blocks will be the Democrat-controlled Senate and the veto pen of BHO. Republicans gained a lot of ground in the States, as indicated by the pickup of 12 governorships. (The Democrat pickup in California makes little difference in cloud-cuckoo-land, where the main difference between Arnold Schwarzenegger and his successor, Moonbeam Brown, is their accents.) Greater GOP strength at the State level will mean two things: more resistance to the expansion of federal power, and redistricting of the House in ways favorable to future Republican prospects. The next two years at the “seat of government” (SOG) in D.C. will be filled with GOP initiatives to roll back the Obama agenda, name-calling by Democrats, and (I hope) gridlock combined with some rollback of Obamacare. Pork disguised as stimulus, which did not and will not stimulate because the economy isn’t a hydraulic mechanism that responds automatically to pump-priming. Financial regulations that will make it harder for Americans to borrow money. A Rube Goldberg plan for reforming the health care “system” that will make it harder for Americans to obtain insurance and less rewarding for doctors and other providers to deliver medical services. Such is “progressivism” at work: Good intentions (to put the best face on it) thwarted by unintended consequences because “progressives” believe that “hope and change” trump the realities of economic (and social behavior) — realities that “the masses” are able to grasp, if only viscerally. I have news for “progressives.” When you talk down to most adults — and even to a lot of children — they quickly perceive three things: (a) you don’t respect their intelligence and (b) you are therefore trying to do something that’s against their interest. You really lose them when you promise things that they know (or suspect) will cost them liberty as well as money. “Progressives” seem to believe in economic stability at any price, including the price of liberty and prosperity. A lot of “the masses” aren’t buying it. Good for them. In “Parsing Political Philosophy” I suggest that our descent into statism may continue indefinitely. The suggestion is based on years of observing American politics, which have brought me to the understanding that voters are profoundly irrational. They prefer statism to liberty, regardless of what they say. They (most of them) believe statism to be benign because it often wears a friendly face. But statism is not benign; it is dehumanizing, impoverishing, and — at bottom — destructive of the social fabric upon which liberty depends. an argument for the likelihood of one event or trend given another. Invoking the “slippery slope” means arguing that one action will initiate a chain of events that will lead to a (generally undesirable) event later. The argument is sometimes referred to as the thin end of the wedge or the camel’s nose. That is to say, once a polity becomes accustomed to relying on the state for a particular thing that should be left to private action, it becomes easier to rely on the state for other things that should be left to private action. the commonly observed phenomenon that some processes cannot go backwards once certain things have happened, by analogy with the mechanical ratchet that holds the spring tight as a clock is wound up. As people become accustomed to a certain level of state action, they take that level as a given. Those who question it are labeled “radical thinkers” and “out of the mainstream.” The “mainstream” — having taken it for granted that the state should “do something” — argues mainly about how much more it should do and how it should do it, with cost as an afterthought. Perhaps the best metaphor for our quandary is the death spiral. Reliance on the state creates more problems than it solves. But, having become accustomed to relying on the state, the polity relies on the state to deal with the problems caused by its previous decisions to rely on the state. That only makes matters worse, which leads to further reliance on the state, etc., etc. etc. More specifically, unleashing the power of the state to deal with matters best left to private action diminishes the ability of private actors to deal with problems and to make progress, thereby fostering the false perception that state action is inherently superior. At the same time, the accretion of power by the state creates dependencies and constituencies, leading to support for state action in the service of particular interests. Coalitions of such interests resist efforts to diminish state action and support efforts to increase it. Thus the death spiral. Can we pull out of the spiral? Not unless and until resistance to state action becomes much stronger than it is. Nor can can it be merely intellectual resistance; it must be conjoined to political power. The only source of political power toward which anti-statists — and disillusioned statists — can turn is the Republican Party. And if the GOP does not return to its limited-government roots, all may be lost. Many Republicans recoil from being combative adversaries of a popular president. They shouldn’t. Opposing Obama across-the-board on his sweeping domestic initiatives makes sense on substance and politics. His policies–on spending, taxes, health care, energy, intervention in the economy, etc.–would change the country in ways most Americans don’t believe in. That’s the substance. And a year or 18 months from now, after those policies have been picked apart and exposed and possibly defeated, the political momentum is likely to have shifted away from Obama and Democrats. This scenario has occurred time and again. Why do you think Democrats won the House and Senate in 2006 and bolstered their majorities in 2008? It wasn’t because they were more thoughtful, offered compelling alternatives, or had improved their brand. They won because they opposed unpopular policies of President Bush and exploited Republican scandals in Congress. They were highly partisan and not very nice about it. If Republicans scan their history, they’ll discover unbridled opposition to bad Democratic policies pays off. 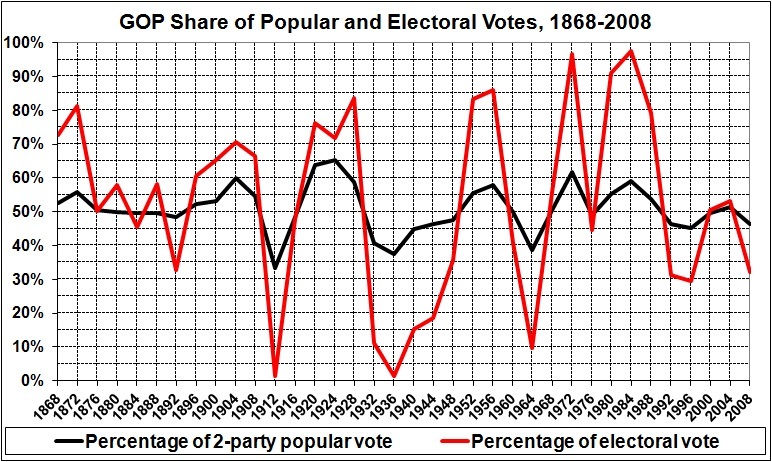 Those two factors, unattractive policies plus strong opposition, were responsible for the Republican landslides in 1938, 1946, 1966, 1980, and 1994. A similar blowout may be beyond the reach of Republicans in 2010, but stranger things have happened in electoral politics. They’ll lose nothing by trying…. Republican efforts to escape being tagged the party of no are understandable…. But no matter how restrained and sensible Republicans sound or how many useful ideas they develop, they’re probably stuck with the party of no label. They have more to gain by actually accepting the role and taking on Obama vigorously. If they come to be dubbed the party of no, no, no, a thousand times no, all the better. It will mean they’re succeeding. In other words, Republicans might make some headway against the forces of statism if they will simply live up to their reputation for “meanness,” instead of apologizing for it — as they have been doing for decades. (Here’s how not to do it.) In order for that to happen, the Cheney wing of the party must prevail over the Powell wing. The good news is that the Powell wing — as represented by RINOs like Susan Collins and Olympia Snowe — may simply choose to follow Arlen Specter’s cynical conversion to the party of statism. If the GOP fails to revert to its small-government stance, all may be lost. Democrats will be free to spend and spend, elect and elect, until — somewhere down the road — voters finally rebel. But until that distant day, Democrats will have enacted so many more crippling laws and regulations, and appointed so many more lawless judges, that nothing short of a constitutional revolution could rescue us from our political and economic hell. Having had one constitutional revolution, I doubt that we will be lucky enough to have another one. Only a wise (and rare) élite can establish and maintain the somewhat minarchistic state we enjoyed until the early 1900s. The existence of such an élite — and its success in establishing a lasting minarchy — depends on serendipity, determination, and (yes) even force. That we, in the United States, came close (for a time) to living in a minarchy was due to historical accident (luck). We had just about the right élite at just about the right time, and the élite’s wisdom managed to prevail for a while. That we have moved on to something worse than minarchy does not prove the superiority of statism. It simply suggests that our luck ran out because statism was (and remains) inevitable in a representative democracy, where irrational voters fuel the power-lust of politicians, and politicians gull irrational voters. But I have not lost all hope (because of this, in part). And so, I await with interest (and some hope) the outcome of the struggle for the Republican Party’s soul.